Scattered thunderstorms. Low 56F. Winds S at 5 to 10 mph. Chance of rain 60%. PLATTSMOUTH – Generosity and compassion have been two hallmarks of the Cass County flood recovery effort over the past four weeks. Several local organizations spotlighted those two traits Wednesday with a large shipment of supplies for flood victims. 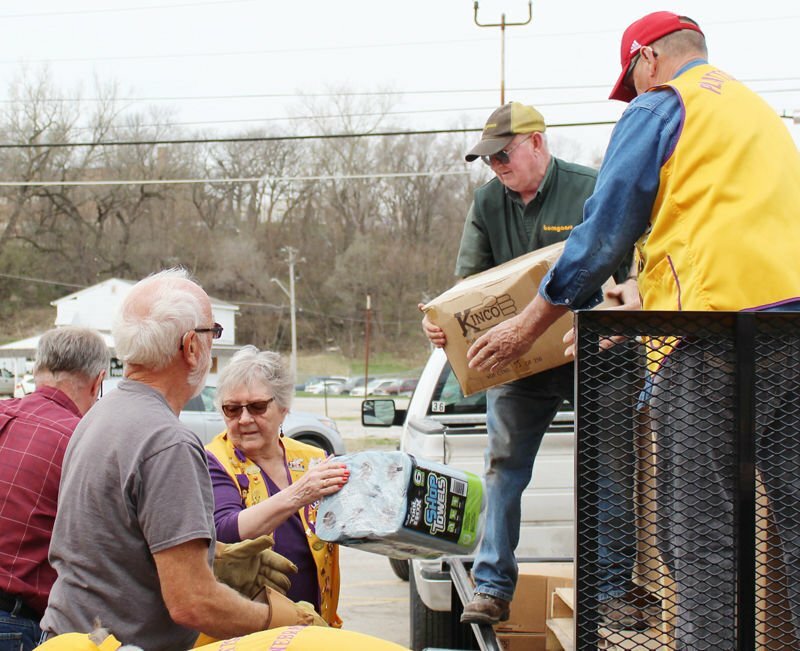 Members of Plattsmouth Lions Club, One Life Church, Hosanna Lutheran Church and Bomgaars joined forces to bring more than $2,000 of items to Plattsmouth. The delivery included 40 industrial-sized brooms, 40 large shovels, boxes of trash bags, rolls of heavy-duty paper towels and many cleaning supplies. Plattsmouth Lions Club members spearheaded the donation effort with funds they received from the Lions Club International Foundation. Plattsmouth Lions Club Council Chair Mavis Hall said everyone associated with the group wanted to pitch in to support their neighbors and friends. The Lions Club International Foundation recently announced it would donate $30,000 to help Nebraska flood victims recover from the natural disaster. The regional district received $5,000 and Plattsmouth’s chapter received $2,000. Plattsmouth members soon reached out to local congregations such as Hosanna Lutheran Church and One Life Church to see how they could best use the money. They learned church volunteers were traveling around the area to help homeowners empty their properties of dirt and debris. The Lions decided to target their funds toward purchasing items that volunteers would need to accomplish those flood-relief tasks. The Lions contacted officials at the local Bomgaars store and arranged for items to be delivered to the former Steube’s Thriftway building in downtown Plattsmouth. One Life Church members bought the building last month and had been planning to convert it into a new worship facility. They put that strategy on hold when the Missouri and Platte rivers began to spill out of their banks and cause destruction in local areas. Church members decided to create a large warehouse of flood-relief items for people to pick up free of charge. The former grocery store now features pallets of bottled water, rows of toilet paper and towels and bins full of bleach and window cleaners. All flood victims are welcome to visit the warehouse and collect items they need to use. Haizlip and Hosanna Lutheran Church Pastor Jim Spanjers both said many local residents have devoted their time and resources to help others. Haizlip said the pallets of bottled water have been one example of that support. Many flood victims have picked up packages of water at the facility, but the amount on the pallets has remained the same. This has happened because people have been donating water at a rapid clip every day. Bomgaars employees delivered the cleaning supplies shortly after 11 a.m. Wednesday and volunteers hauled the new pallets into the warehouse. The total cost of the items was $2,127.95, which Hall said was far below their market value. The flood relief warehouse is located at 624 Avenue A in Plattsmouth. It will be open from 6-8 p.m. on Tuesdays, Wednesdays and Thursdays and 10 a.m.-2 p.m. on Saturdays. Volunteers will also be available from 2-6 p.m. on Sundays to assist flood victims.